iturel has built a 'shrine' in which to safeguard the Grail and reserve it for the egoistic 'self-intoxication' of an élite band of men who have misappropriated that symbol of compassion and turned it into a fetish. The institutionalisation, petrifaction and dogmatisation of the original Grail idea has imparted a sense of élitism and exclusivity. nstead of judging the world around them on its merits, the knights take a purely subjective view of it. The social functions of their brotherhood have taken second place to a striving for personal perfection that finds its clearest expression in Titurel's advocacy of asceticism. The guardians of the symbols of compassion are devoid of compassion themselves and incapable of healing or redeeming Amfortas. Their estrangement from the original Grail ideal is clearly demonstrated by Titurel's contemptuous spurning of Klingsor and the arrogance of a band of men who set themselves above the dualism of male and female. The evil in Klingsor is not primordial: it stems from the lack of goodness in Titurel. Note: for another discussion of the sin of Titurel, see Klier. he other two factors that interest me are Wagner's description of Parsifal as a Bühnenweihfestspiel [stage dedication festival-play] and as a Weltabschiedswerk [world-farewell-work]. Both these terms have long been vitiated by ridiculous clichés and deliberate misunderstandings. They do, however, possess a long tradition, because Cosima's diaries make it very clear that she herself construed Parsifal as only quasi-religious from the first, twisting it almost into Catholicism and conceiving of it as a substitute religion. Hans von Wolzogen, editor of the Bayreuther Blätter, also helped to foster this idea. Although Wagner was in general very pleased with an essay of his entitled Bühnenweihfestspiel, he was quick to comment that Wolzogen was going too far when he characterized Parsifal as a portrayal of Christ: I did not have the Saviour in mind at all . ere, time becomes space . One of Wagner's most often quoted statements, enigmatic, baffling. In what space, what time, is Parsifal set? In the northern mountains of Gothic Spain, in the chivalric Middle Ages, in Arab Spain? Yes, if we interpret the letter, not the spirit, of the information Wagner gives. Parsifal's space is an imaginary space, the time in which Parsifal takes place is an imaginary time. As soon as space appears, past and future time become the present. Light creates space, changing light is changing time. he scene of events is surrounded and enclosed by vertical objects of a crystalline structure. Crystal, a formation from the dawn of nature, with its transparent, natural tone, is capable of absorbing light and colour and is brought to light by light -- coloured light. Light is life. This life is brought by light out of the vast, cosmic night of the universe. 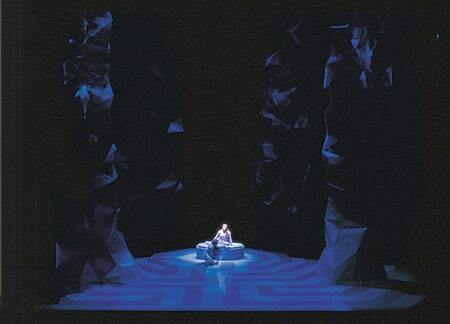 he acting area in Parsifal is a labyrinth, the basis and bedrock of our existence. 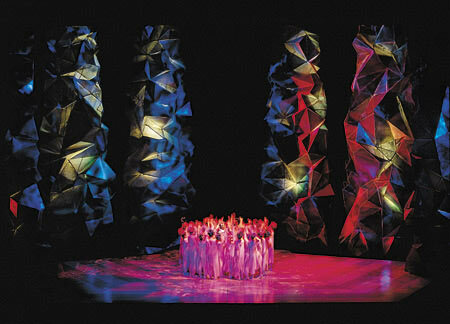 The labyrinth neutralizes space and time, and is itself space and time. The problem is to find the right access; then the path leads to the central point, the end of the labyrinth and its new point of departure. Each of us creates that central point or objective as his personal solution. Titurel places the altar in the centre as a sanctum for the Grail, Klingsor creates an imitation of that sanctum, which to him possesses equal significance, for Kundry to appear in. Parsifal picks up the spear, holding it horizontally, i.e. non-aggressively, and thus turns the sacred spear, which has been misused as a weapon, back into a holy relic. That is the form in which he brings it back into the temple. he sacred spring also flows in the centre, a theatrical translation of what Wagner, in Act II, calls the source of salvation for which Kundry and the Knights of the Grail all yearn: what Friedrich Hölderlin calls the sacred, sober water that not only washes away guilt but soothes, purifies and allays ecstasy and longing. n contrast to crystal, a changeable material, the temple is rigid and abstract in design, and the light within it is calculated, not natural. The Grail must only shine for an esoteric elect in a confined space. The temple's monumental architecture cites architectonic elements from various cultural epochs: Assyro-Babylonia, the ziggurat motif, echoes of Mexican Aztec cult sites and of post-Modernist architecture. Architectural metaphors are a principle and instrument of authority, also associated with prisons and barracks. Monumental architecture has always been mausoleum and funerary architecture as well: the monument as an expression of the desire for perenniality and eternal life. This is Titurel's original sin, his betrayal of the living Grail idea. He misconstrues his function and guards the Grail by hiding it away, walling it in, reserving it for an élitist clique, appropriating it to himself and legitimising his claim to God's grace by using the Grail as an adjunct to magical, mysterious ceremonies. The tormented Amfortas longs to die, but Titurel, as ossified as his own conception of the Grail, wishes to obtain eternal life by means of that symbol of life. He creeps around the temple and withdraws to his government bunker. A cruel, unseen giver of orders, he mercilessly compels Amfortas to fulfil his office because he has no wish to renounce his life-prolonging drug, the Grail's sacred bliss. he only character to transcend time and space is Kundry, for whom both are permeable. Past, present and future are embodied in her single person. She was there and saw much before ever Titurel erected his castle for the Grail -- she emerged from space on her aerial steed like an Amazon, a Valkyrie. Kundry is accursed because she mocked the sufferer. Imprisoned and obsessed by her notion of the male as a heroic idol, she found the suffering king unmanly and contemptible. Now she must tread her own path of suffering. Although she is not the primordial she-devil by nature, men treat her as such. n Act III Gurnemanz and Parsifal champion the storm-tossed Kundry in a humane, sympathetic way and accept her as the feminine principle which Titurel has consistently (and to its detriment) eliminated from his Grail community. As an individual, Kundry is released from the curse of eternal rebirth. As an embodiment of the feminine principle, she remains alive and is admitted to the temple¹. In one simultaneous, mirror-image-like movement, Titurel's coffin is closed and borne away while the Grail shrine is opened. The temple has been demysticized. The work's great finale is reserved for the music, and its lingering resonances are conceived of as Wagner's attempt to sketch, in musical terms, the world of the Grail in its ideal state: a world of humane spirituality. Footnote 1: Wolfgang Wagner noticed something that many commentators have overlooked. Kundry is admitted to the temple as the first woman to be allowed to participate in the religious ceremonies of the community. This is one of the elements that Parsifal absorbed from the unfinished drama Die Sieger. Like the Buddha in Wagner's scenario, Parsifal becomes the leader of a religious community, from which women (and the feminine) have been excluded, and through compassion gains the wisdom to admit the woman. In Die Sieger the woman who was admitted to the religious community was Prakriti; in Parsifal the woman who is admitted is Kundry, the Samaritan of the Grail.